People often ask me, “what is it like to own a helicopter?”. It depends on who is asking what my answer will be. The basic answer is, GREAT! To be free to fly, see and set down pretty much where you want is such a fun adventure. It isn’t all fun and games though. 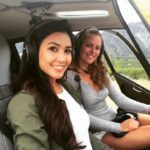 I hope to share with you a few things involved with owning a helicopter and a helicopter business. 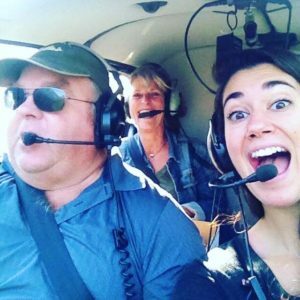 A basic starting point in flying helicopters is the big, how do you do it? There are many ways to get started. I took the route of getting my Private airplane license years ago. A friend of mine lied to me and said I could get my helicopter added onto my airplane license cheap and easy. Well, it wasn’t cheap or easy. It took me about a year of going to Spokane for training. I tried to go twice a week and on each trip taking two lessons. As life goes I was unable to go every week and not always able to take two lessons when I did go. 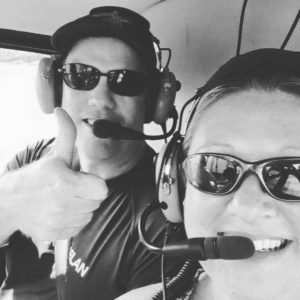 Getting my Private Helicopter License was a real accomplishment but to get any returns off of the investment I needed to finish my Commercial License. The Commercial License took me another few months of training. I then lied to my wife and told her the only way I could recoup the training expenses was to buy a helicopter…by now I think she knew I was lying and just rolled her eyes and said it was ok.
Once I had my license in hand and bought a helicopter my first job was to dry cherries. When cherries are getting ripe any rain will collect in the stem bowl at the top of the cherry. If the water sits there for a long period of time the cherry will absorb the water. The skin on the cherry cannot expand quick enough and the extra water will cause the cherry to split. Once split the cherry is of no value. By hovering, flying slow, over the trees we are able to knock enough of the water off the cherries to save the crop. My next adventure was to take real people up for rides. Being responsible for real people added stress and more oversight from the FAA. The rides consisted of taking off and landing at the same location and staying within a certain distance. After a while I decided to get my Charter Certificate so I could take people from one location and stop or drop them off at a different one. This came with much more FAA oversight and required I develop an operating manual. Some of the additional requirements mandated I not do very much maintenance on the helicopter at all. Prior to the Charter Certificate I could change the oil, spark plugs, lights and other simple tasks. Once I obtained the Charter Certificate I could no longer do those tasks. By having a certified aircraft mechanic do those tasks increases the safety of the flights. Each aircraft has parts on it that have time limits. These times are usually decided on due to accidents or failures of previous aircraft. Records are needed to make sure all the parts are within their expected life time limits. By tracking and replacing these parts on a regular basis we can ensure the helicopter is safe to fly, not matter it’s age. Prior to each flight a Pre-Flight Inspection is completed. We are checking to make sure the proper maintenance is done, parts that should move do and parts that should not move don’t. Fluid levels, belts, blades, seatbelts, doors and their latches, gauges, screws and rivets. It is so much better to find an issue on the ground and not take the flight than it is to find out there is a problem while in the air. At the end of each flight a Post-Flight Inspection is also conducted to make sure belts and gear boxes are not hotter than normal and no damage occurred during the flight. 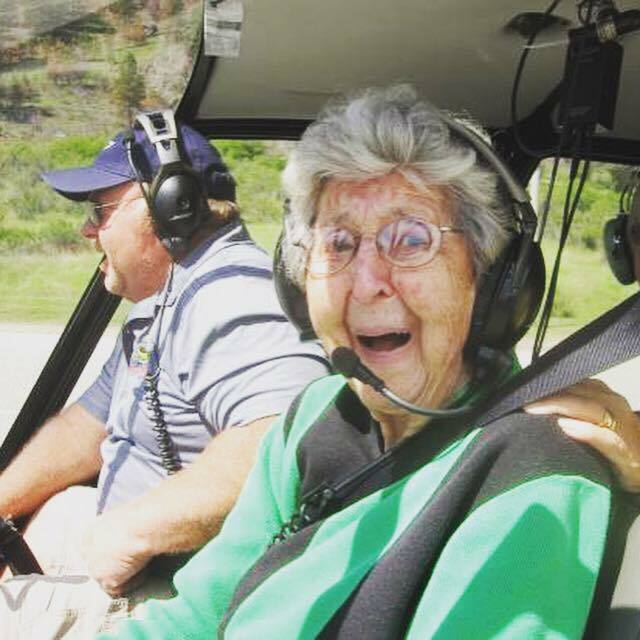 I can’t express the joy I feel when I get to take people up for their first flight or on a special occasion. Some of my most favorite flights have been to take “old” people up over the areas they grew up in, seeing from the air the spots they worked and played. To see their excitement and hear their memories makes my efforts well worth it. Why this type of helicopter? Outside of the wedding we attended, this was the highlight of our trip! We booked Dale for the hour, and he let us split the hour into three 20 minute rides. There was 7 of us total. The helicopter only holds 3 people and/or 500 pounds. Twenty minutes in the air was the perfect amount of time in the air for me. The helicopter landed in the field right next to our hotel. All of it was so easy and so much fun. I highly recommend! Dale provides an excellent service. 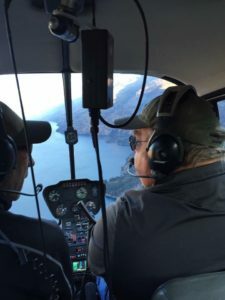 Highly professional, friendly and informative about the flight and scenery. Don't miss the opportunity!